How do I analyze data in SPSS for central tendency and dispersion? 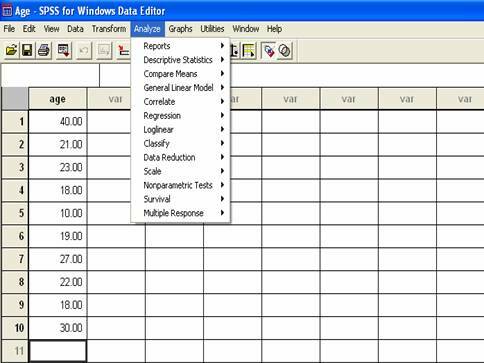 Home > How do I analyze data in SPSS for central tendency and dispersion? Click the Analyze menu option at the top of your screen. You will see many options to choose from. Some options lead to complex analyses. Others lead to those that are quite simple. We will be using the Analyze menu a lot in this book. Remember that with measures of central tendency and dispersion, we are trying to describe data. So it makes sense that you should click the Descriptive Statistics selection. After this, click Frequencies. This box will appear with two windows. You will see your variable name in the window on the left. See the variable Age in the left window? Your first goal will be to get that variable name over to the window on the right. But how do you do that? It’s easy. Just highlight the variable by clicking on it. Then click the button with the arrow that you see in the middle of the two windows. I have highlighted it here in red. The Age variable should appear in the window on the right. 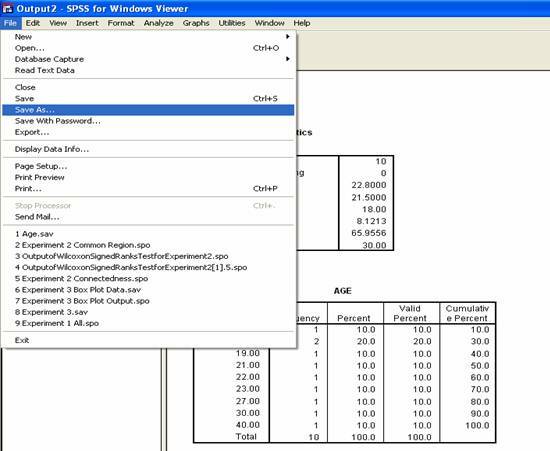 Variables that appear in the window on the right are the ones that will be analyzed. So by moving the variable over, you are telling SPSS to analyze this variable. So why did we just do that? 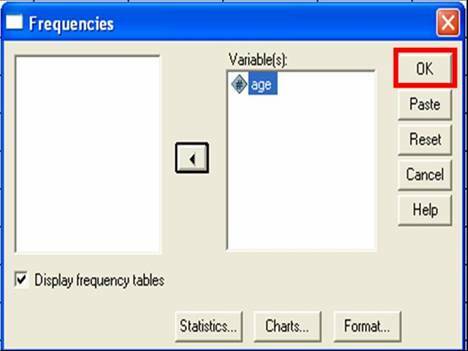 Shouldn’t SPSS know that the Age variable is the one we want to analyze? After all, it’s the only one there! The reason we move our variable from left to right window is that sometimes people have more than one variable in their data file. In these cases, they will see a long list of variables in the window on the left. They have to choose from this list and move only the variables of interest to the window on the right hand side for analysis. 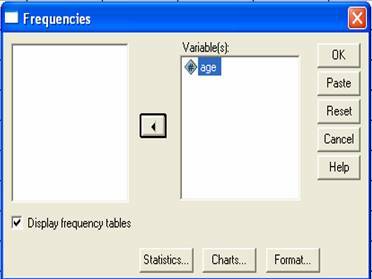 The next step is to click the Statistics button in the bottom of the Frequencies box. 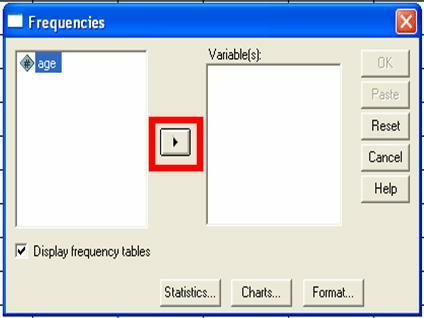 A Frequencies:Statistics box will appear. 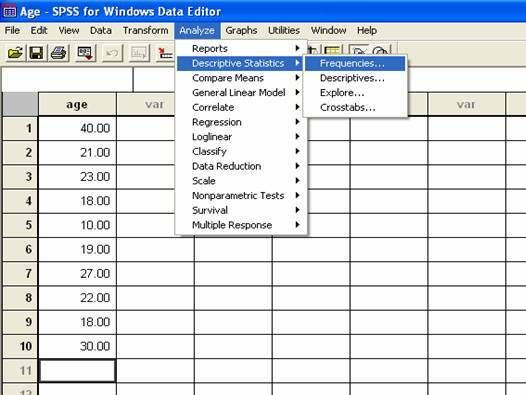 This box will let you choose a variety of statistics to use on your data set. 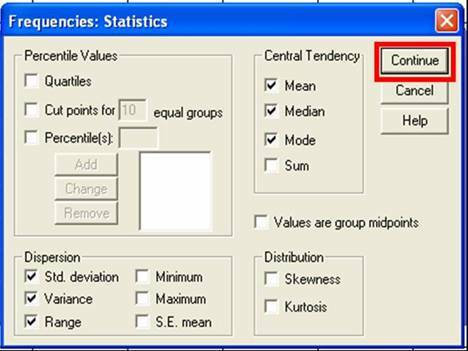 You can see groupings of various types of statistics like central tendency and dispersion. You will see little white boxes next to each type of statistics. You can put a check in one of those boxes simply by clicking the box. 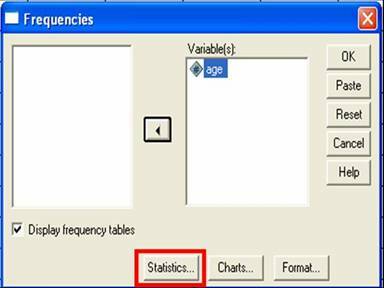 You check tells SPSS to compute that particular statistic named next to the box. 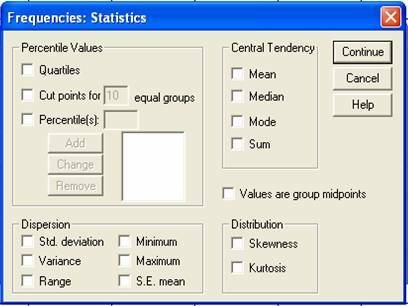 Because you are interested in central tendency and dispersion, you can check the boxes in these areas. You can also check other boxes if you are curious. When you are finished, click the Continue button. When you do the previous steps, you will get back to the Frequencies box. Just click OK when this happens. You should see your results. 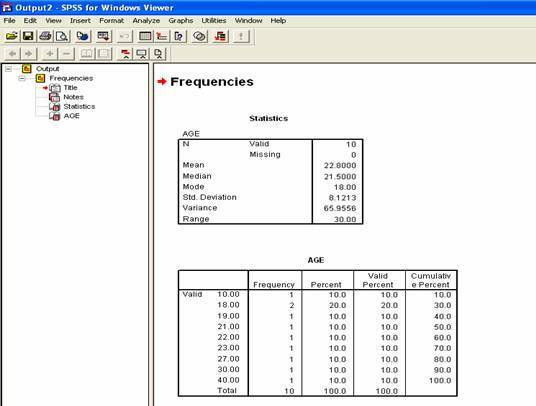 SPSS calls the results the output. It creates a special output file that is different than the file you used to enter the your data. The output file for this type of analysis will look something like this. You are not completely finished with data analysis. The final step is to save the output file to a meaningful place with a meaningful name – just like the data file you saved earlier. Ideally, you would save both files to the same disk or folder on your computer. How do I save the output file? Just click File and the Save like you did with the data file. It’s easy. Choose a name that will be meaningful to you in the future. This name should be slightly different than the name that you gave to your data file. This difference in names will help you to tell the files apart in the future. For this file, I will call it Age_Output. This name tells me that the file stores the results of the analysis for the Age variable. Remember how we talked about the data file extension .sav? There is a different file extension that SPSS uses for output files. This extension is .spo. So, if you used the name Age_Output, the official name of the file would be Age_Output.spo. You must close the output file if you want to go on and do another analysis in SPSS. Otherwise, the output from your new analysis will be added to the output of your old analysis. This gets confusing!